Whenever you read 'dhaba style' (street food joint style), you must be thinking that the recipe will be interesting ... right? Well, you are not wrong. 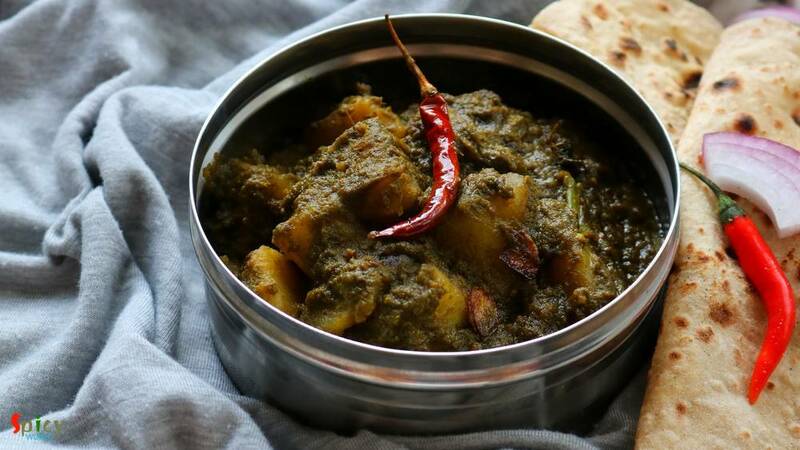 This recipe is very, very exciting and creates exact taste of Dhabewali Aloo Palak. 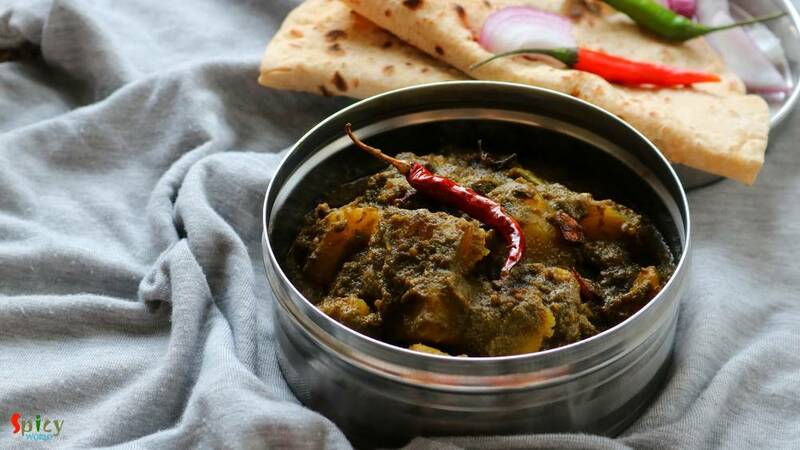 It is close to Palak Paneer recipe but slightly different and little low in calories. 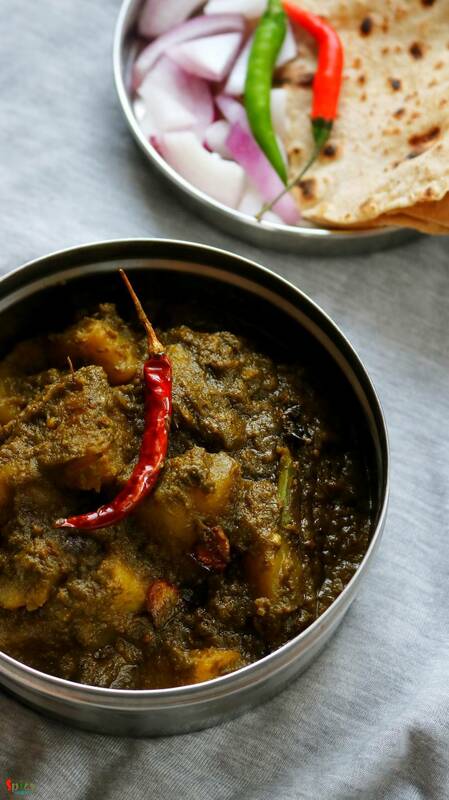 This dish goes best with plain chapati or naan. Try this in your kitchen and let me know how it turned out for you. 2 large potatoes, cut into big cubes. Puree of 1 large tomato. Half cup of spinach puree. 1 Tablespoon of crushed cumin and coriander seeds. Spice powder 1 Teaspoon each (turmeric powder, red chili powder, roasted cumin and coriander powder). 1 Teaspoon of chaat masala. Half cup of hot water. 1 Tablespoon of crushed kasuri methi / dry fenugreek leaves. Heat oil in a pan and the potatoes for only 2 minutes. Then take them out in a tissue paper. You can use baby potatoes instead of potato cubes. Remove excess oil from the pan and add crushed cumin and coriander seeds in 3 Tablespoons of oil. Saute for few seconds. Then add chopped onion and fry for 5 minutes. Then add ginger garlic paste. Cook for 2 minutes. Add all of the spice powder and cook on low flame for 1 minute. After that add condensed milk and cook for 1 minute. Then add tomato puree and cook for 5 minutes. Add spinach puree and cook for 10 minutes on low flame. Now add fried potatoes, salt and chopped green chili. Mix well and cook for 5 minutes on medium flame. Add hot water, mix well and cook until potatoes become soft. Then sprinkle garam masala powder and chaat masala. Mix well. Heat ghee in another small pan. Saute dry red chili and chopped garlic for a minute. Then add dry fenugreek leaves, give quick stir and immediately pour this in the curry. Mix well and turn off the heat. 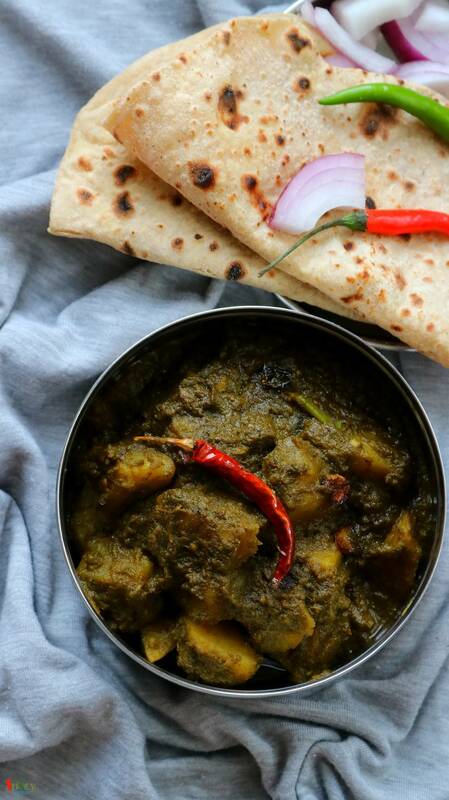 Your Dhaba style Aloo Palak is ready.